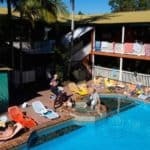 The Arts Factory Lodge, budget accommodation in Byron Bay, was originally created in the 70’s by hippies and local and international artists, in the 80’s it was an internationally recognised rock and roll venue. 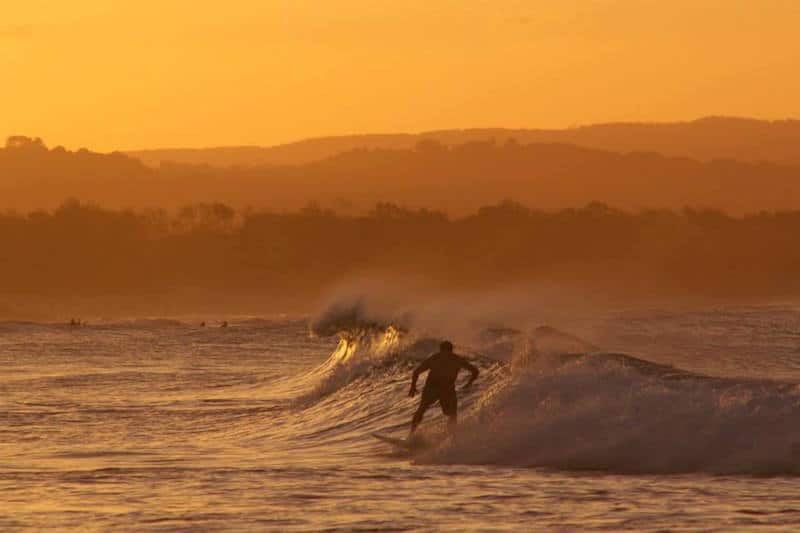 Some say that it’s The ‘Birthplace’ of much of the fame and spirit of Byron Bay, The Arts Factory Lodge still maintains that original spirit today. 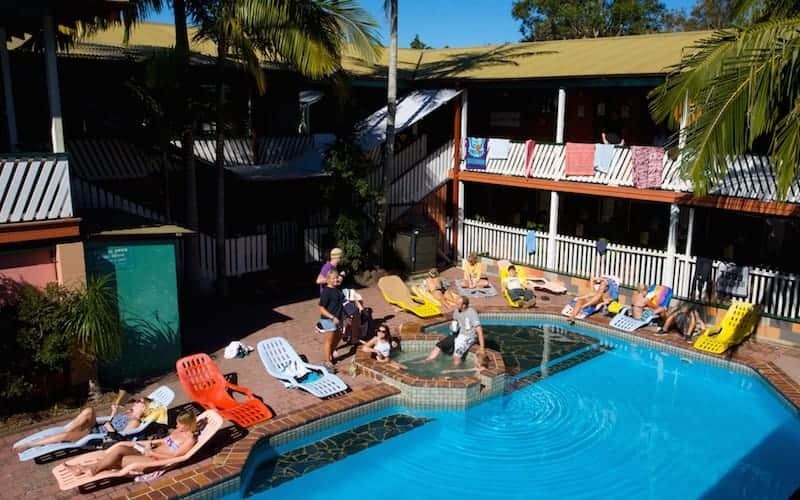 Laze by the pool, swing in the hammocks and soak up the friendly atmosphere for which we are universally famous. Our Funky Workshops include Didgeridoo Making, Yoga and more. 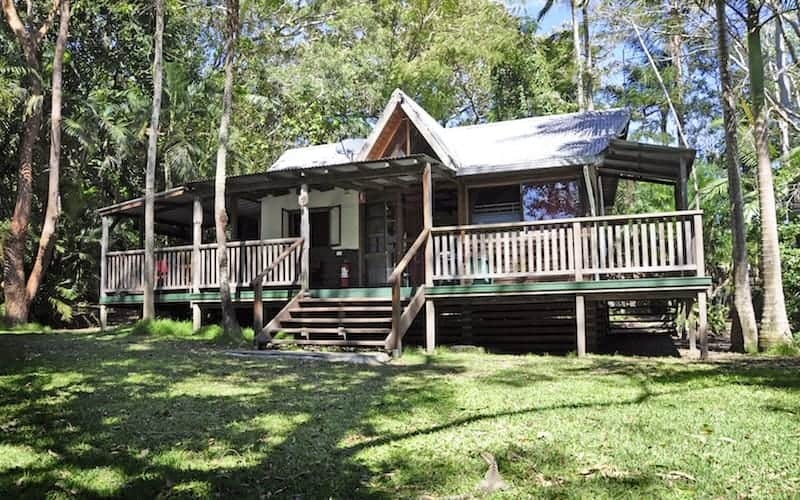 Or go on an Australian Bush Tucker Tour. Join in a game of table tennis or volleyball. Jump in the pool. 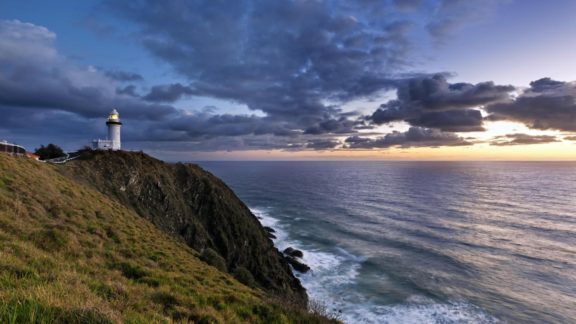 Hang out in hip Byron Bay or relax on the spectacular beaches. 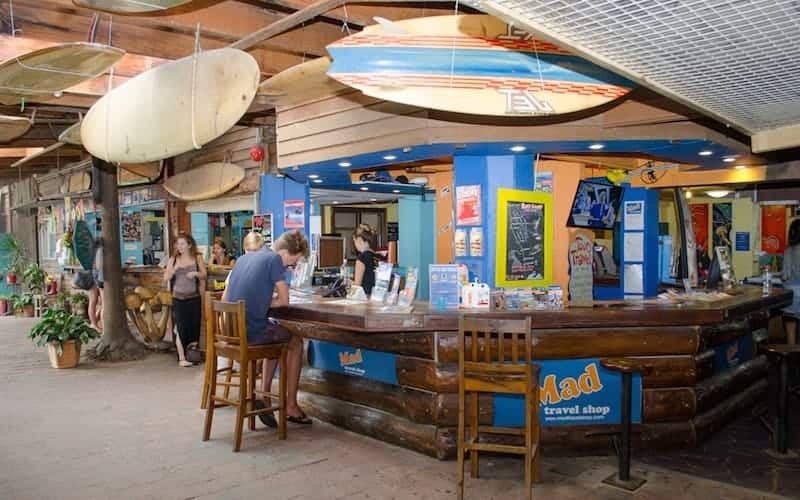 In the evening enjoy DJ’s, Bands, Live Performances at the Byron Bay Brewery or the Zany Talent Show every Tuesday Night. 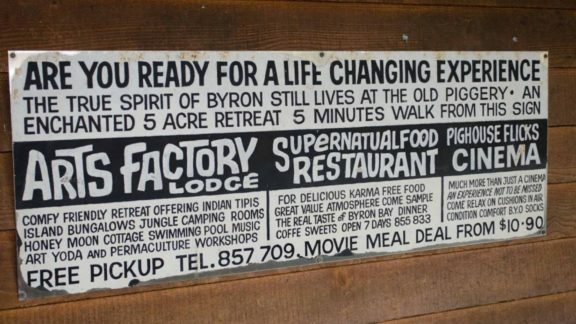 Don’t miss the ‘Experience of a Lifetime’. 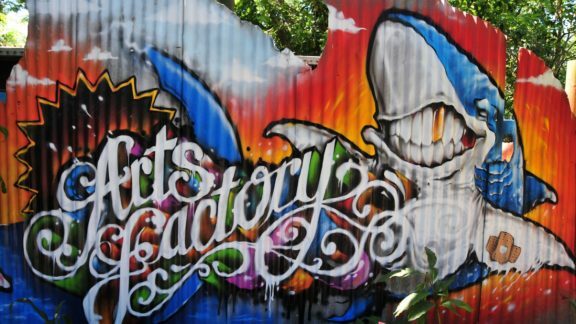 Come stay at The Arts Factory Lodge hostel Byron Bay and Relax, Rejuvenate, Recycle! 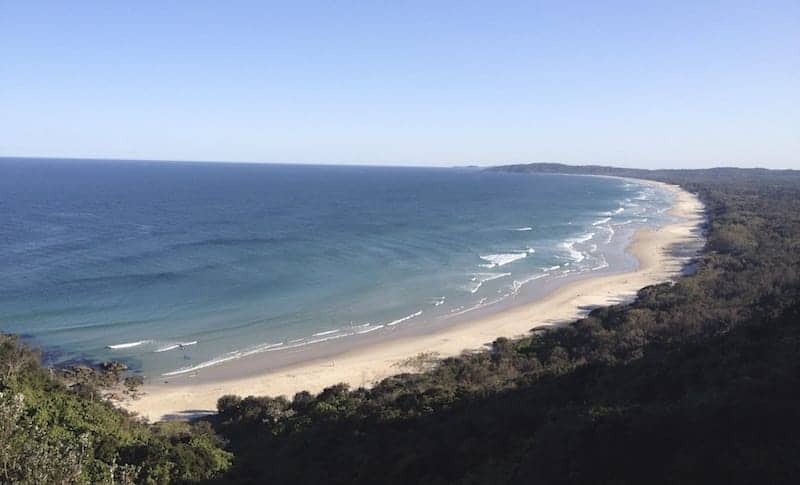 Our Byron Bay Hostel and campsite is located only 10 minutes walk from the beach! 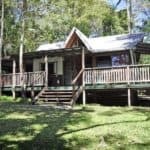 From the Airport: Transport available from Brisbane, Gold Coast and Ballina airport by paid private shuttle bus companies. and Train Stations: Free shuttle from the main bus station, runs to meet most Greyhound and Premier buses. If not it’s a 10 minute walk. 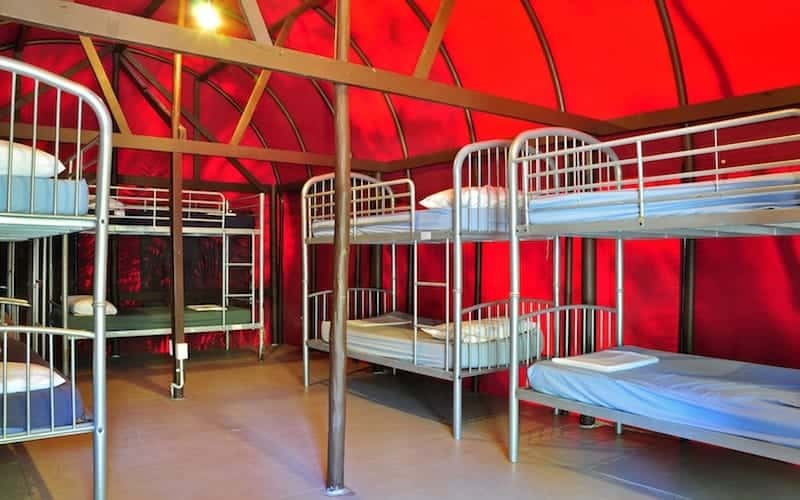 SHUTTLE TIMES : 7:30am, 8.40am, 11.15am, 11.55am, 12.30pm, 1.15pm, 2.45pm, 4:45pm, 6.40pm This is the time it leaves the hostel. From the Motorway: The entry to Byron Bay from the Pacific Highway is along Shirley Street. Turn right at Butler Street then take the second right hand turn to Burns Street and follow it until you reach the Byron Bay Brewery on Gordon Street, keep going around the corner and you will reach the hostel car park entry at 1 Skinners Shoot Road. Parking: Free parking at the hostel. Supermarkets: Woolworths – 15 min walk. 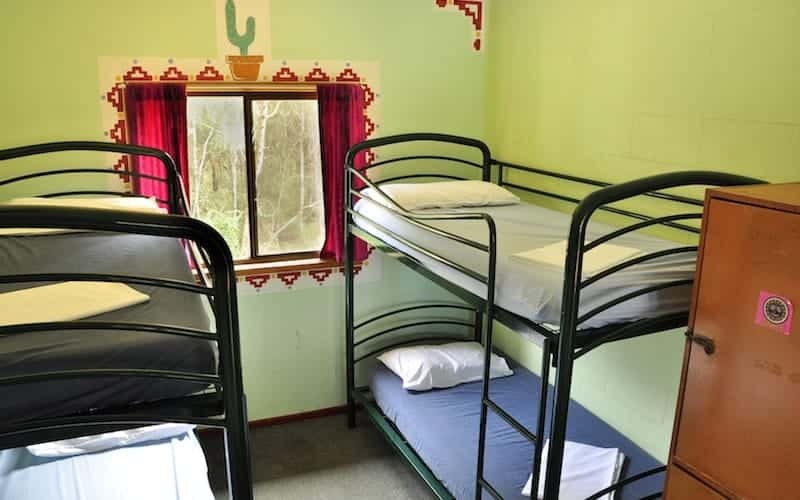 At the Arts Factory Lodge, it is important to us that our international guests leave our hostel (and Byron Bay) satisfied that we have their interests at heart. We measure our success with their feedback, to ensure we constantly deliver a warm, inviting and safe environment for the traveler. For these reasons we DO NOT accept group bookings for bucks nights, hens nights, footy trips or schoolies or persons under 18 years of age. 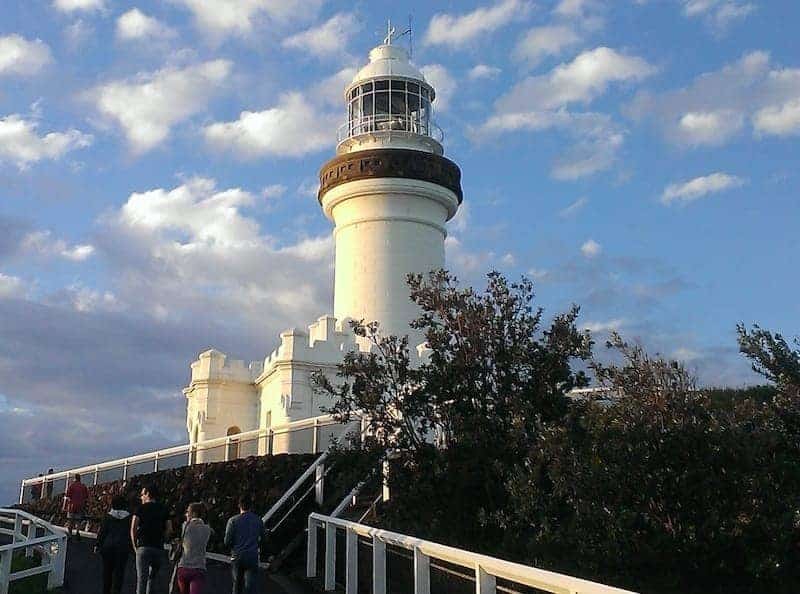 Go to our Byron Bay Group Booking Enquiries page for more information and to fill in a group booking enquiry. *Please note that Amex cards are not accepted. 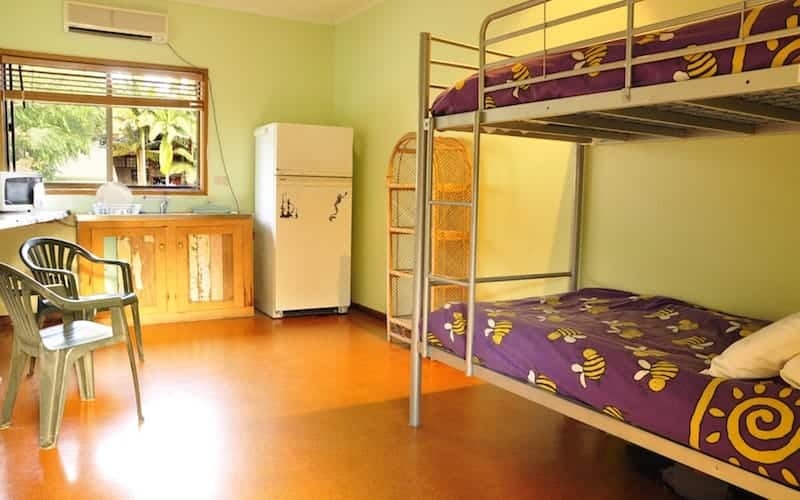 The Arts Factory Lodge encapsulates the social fabric that defined the cultural revolution of the 70’s, stuck in a time capsule the Arts Factory has sustained the cultural spirit that Byron was built upon. The unique sub-tropical oasis was the location setting for the feature film The Inbetweeners and is popular for fashion shoots, if you’re lucky you might just find yourself in the background! 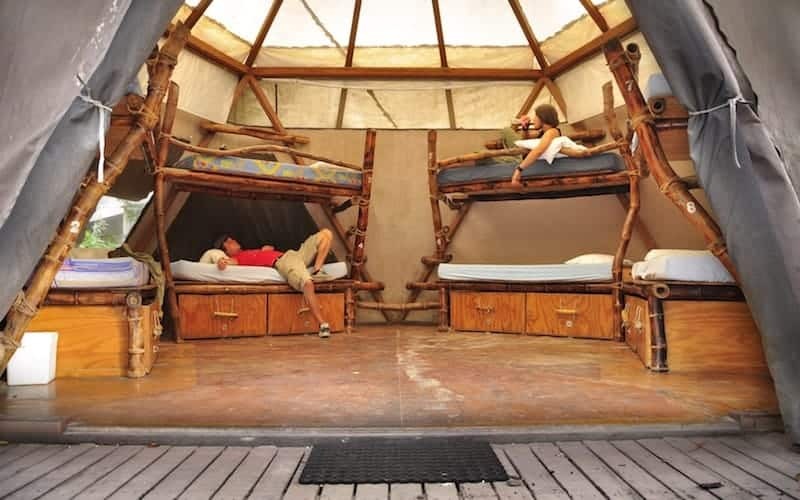 The hippie character of this hostel draws you in with many booking to stay one night then find themselves leaving months or years later. 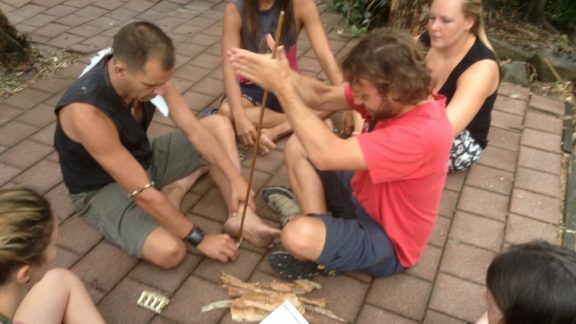 It’s a cultural vortex with enriching workshops where you’ll learn to make and play a didgeridoo, bush tucker lessons and jewelry making sessions. A short 5 minute walk into town you’ll find pristine beaches, street buskers and eclectic bars. Learning to surf is a must ask our team about a Mojo Surf lesson! 10am Vinyasa Flow Yoga ($5 donation). 8pm Reggae Night at The Northern - the only place to go on a Monday night and the BIGGEST REGGAE party ever! 8.30am Meditation Workshop ($5 donation). 12pm Learn to play and make your own didgeridoo ($100-$150). 11am Bushcraft Workshop Learn to make bracelets and wallets (donation). 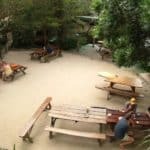 7.30pm Trivia Night in the courtyard. ($2) Winner takes all. 9am Vinyasa Flow Yoga ($5 donation). 8am Meditation Workshop ($5 donation). 9am Yoga with Lulu ($5 donation). 4pm Vinyasa Flow Yoga ($5 donation). 10am Karma Yoga ($5 donation). 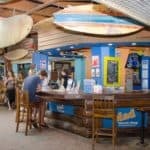 2pm Byron Bay Brewery Tour (free). Enjoy free samples! 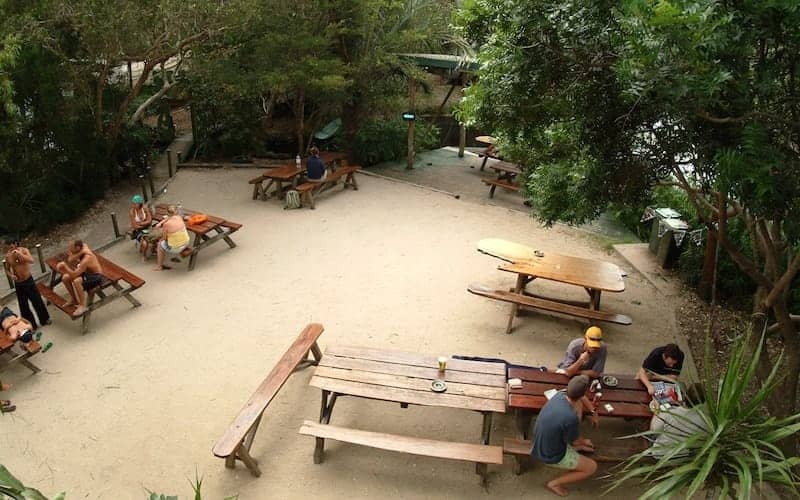 6.30pm Pizza & DJ night at Nomads Byron Bay. 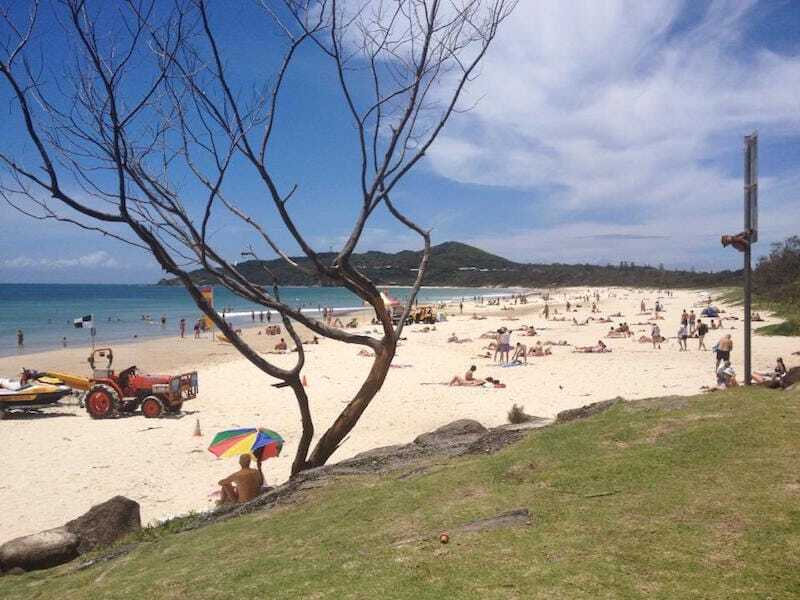 Free courtesy bus to Nomads Byron Bay to enjoy $10 pizza. Live DJ's, drinking games and hot tubs! 4pm Meditation Workshop ($5 donation). 6pm Sunday Sesh Live Music! A different local artist each week jamming in the courtyard.